Where in Russia can you find seals, seagulls, fishing fleets, and fish smokeries at a location hundreds of kilometers from thesea? The answer, of course, is Lake Baikal. 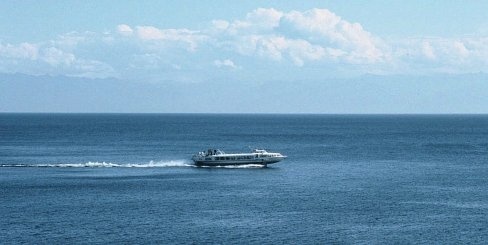 Even the mention of its name brings out the catechism of superlative clichés - “largest,” “deepest,” “greatest volume of fresh water in the world,” and (my favorite) “larger than Belgium.” It seems somehow fitting that Russia, the largest country in the world, should have Baikal, the largest lake. After all, as every Kremlin tour guide will tell you, Russia has the largest of everything else - biggest cannon (that never fired), largest bell (that never rang), etc. Yet little in this barrage of banality helps you get a grip on the unique phenomenon of Baikal. Nearly 75 percent of Russia’s territory lies in Asia, and Baikal is miraculously situated in the center of this vast expanse. The extraordinarily clear water is so pure that it can legally be bottled as mineral water. Locals get a chuckle out of wary tourists who buy bottles clearly marked “Baikal Water,” when it’s available for free by the bucketful. Even academic limnologists’ eyes swell with pride when mentioning that Baikal is at least 20 million years old. Chinscratching skeptics will find this daunting figure easier to swallow once they’ve surveyed some of our outlandish finny friends that live in the lake’s colossal depths. They’re clearly no close relations of anything in your supermarket freezer section. Who needs eyes when you live a mile down? It’s as black as pitch at the bottom of Baikal, and considerably deeper than many seas and oceans. Meet golomyanka, an ancient fish that’s like a translucent rubber sausage. With a body designed to withstand water pressures that would turn scuba divers to car mats, golomyanka has the deep misfortune to explode if it’s ever dragged to the surface by adverse currents, or, more frequently in fishing nets. Baikal has a whole fishing industry, dedicated to catching one fish in particular, the omul. As you have already begun to suspect, nothing at Baikal is that simple: There are actually four kinds of omul, and like three-quarters of the 2,630 species that make their homes at Baikal, they are found nowhere else in the world. With an appearance and taste vaguely similar to trout, omul are Baikal’s best-known export, and the fishing industry has traditionally been the major employer for local villagers. Luckily, the most famous (and elusive) of Baikal’s water-dwellers - the freshwater seals known as nerpa - are strictly protected from any attempts to catch or cull them. Although they are clearly related to seal species found in oceans, nerpa are the only seals that live in fresh water (and Baikal legendarily contains one-fifth of the Earth’s fresh water). This, along with geological studies, points to a time in Baikal’s distant past when titanic forces reshaped the Eurasian continent, trapping what must once have been a sea environment thousands of kilometers from the oceans. Over countless millennia, the salinity of the lake has dropped to zero at a pace the seals could cope with. a village, boasting the new three-star Hotel Mayak at the water’s edge. Almost entirely untouched by modern conveniences are further-flung villages where B&B accommodation with local villagers is all you’ll find … along with two tiny shops selling basic groceries and no eateries at all (most visitors dine with their hosts). Even more remote (despite being nearer to Irkutsk) are fishing villages like Bolshiye Koty, built up against sharp cliffs and accessible only by boat or hydrofoil. Hiking, angling, and outdoor pursuits are why you’d come - there is no nightlife beyond one tiny bar in Listyvanka. The eastern shore is most easily accessed at the Selenga River delta, around two hours drive from Ulan-Ude. Here you’ll hardly see a B&B sign, and accommodation needs to be arranged through a tour company in Ulan- Ude. If you plan on just finding a place to crash when you get there, you’ll be out of luck. 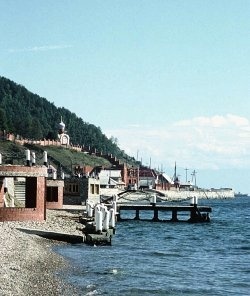 This side of Baikal is far less visited. Come for an excursion, though, and you can buy fish from the smokery, visit the semi-ruined monastery, and then have a fish picnic on the beach. For those who dream of leaving civilization behind, this is the right place: A tin hut selling stale bread and two brands of beer is the only sign of the 20th century. There are no international scheduled flights, and most visitors will travel via Moscow. To Irkutsk there is a choice of daily flights on three airlines: Aeroflot (from Moscow Sheremetyevo-1), S7, and Trans-Aero (both operating from Moscow Domodedovo, which offers a convenient single-terminal connection for international passengers). Flight time is five hours; return fares vary hugely according to season and pre-booking period, from 6200RUR to 12700RUR and higher. To Ulan-Ude the only direct flight from Moscow is on S7 (also from Domodedovo); fares run from 10000RUR to three times this price for those who fail to book early. The Trans-Siberian Railway runs to and around Baikal. To Irkutsk the journey time is five days (four nights), to Ulan-Ude it’s a further 13 hours. The comfortable Baikal Express runs as far as Irkutsk, with accommodation in 2-berth or 4-berth compartments. To Ulan-Ude the best service is the Rossiya Express (which also serves Irkutsk en route), also offering 2- and 4-berth accommodation. A restaurant car operates from breakfast time until mid-evening on both services with a short menu of Russian traditional dishes. Time difference from Moscow: Irkutsk (+5), Ulan-Ude (+6).